Please feel free to contact us with any queries, no matter how small! Flat 1 and parking (if provided) is available from 2.00pm on your arrival day until 10.00am on your departure day. Flat 2 and parking is available from 3.00pm on your arrival day until 11.00am on your departure day. Flat 1 - we currently have an arrangement to rent a space behind Harbour House in the section which is used for winter boat storage. It is only available to us from April to September inclusive as the boats are there in the winter. We will provide a plan showing which space to use. Flat 2 - we have a space all year round in a nearby private car park. It is a walk of a minute or two. This is the same space we have rented for many years. Extra parking - If you wish to book an extra space or if we are not able to provide a space for Flat 1 you can book direct with the owner of a nearby private carpark. Details for this and of other parking options are included in our arrival information as soon as you’ve booked, or we can send the information to you before booking if required. We have a garage on the ground floor which although fairly full already may be available, by arrangement, to store bikes or a canoe etc. No room for a vehicle. 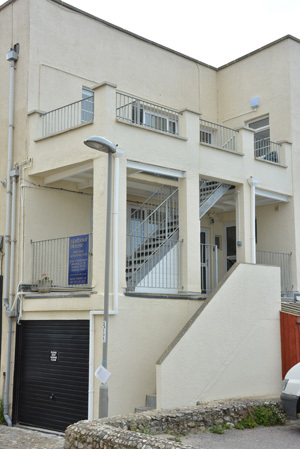 Flat 1 is on the second floor and is accessed using two sets of stairs (12 steps plus 15 steps). There is no lift. Access to the roof patio is via a further staircase. It is necessary to push open a counterweighted hatch to open the roof. Flat 2 is on the first floor (12 steps) and once inside there is one step up from the kitchen into the lounge. EVACUATION AIDS FOR USE IN CASE OF FIRE (EG EVAC CHAIRS) ARE NOT PROVIDED. 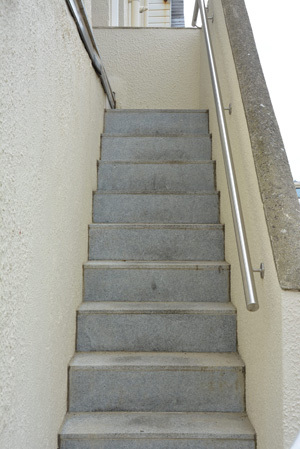 THE BUILDING IS UNSUITABLE FOR THOSE WITH POOR MOBILITY. Once your booking is confirmed you will be able to log into our booking system to access further information including key instructions and also to keep track of your payments. We are committed to protecting and respecting your privacy and will only use the contact data you provide to us in the course of conducting our business with you. We collect information regarding numbers of guests and ages of children in order to assist with providing suitable facilities and improving our accommodation. We may use your feedback or visitor book comments anonymously to advertise our business. We will only contact you regarding any booking you have made. 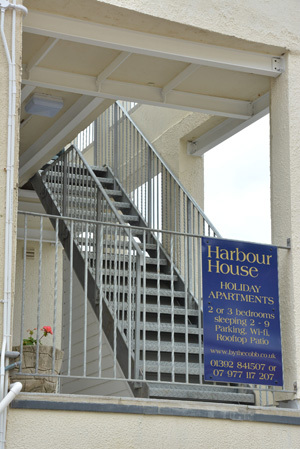 Additionally, if you have given us permission we may also contact you very occasionally with news about Harbour House. In addition, your data is stored by Holiday Bookings Online Ltd who provide our booking system. Other than this we will never sell or give your data to any third party unless required by law. If at any time after your holiday you would like us to delete the data we hold on you, or if you wish to withdraw permission for us to contact you please let us know. Our full privacy statement can be downloaded here. The privacy statement of Holiday Bookings Online Ltd can be downloaded here. If you have booked or contacted us via an agent eg Airbnb please refer to their own privacy statement also. This website only uses a session browser cookie in order for it to function. The browser cookie is simply a random string of characters to identify the visitor. There are no personally identifiable details in the cookie and no real data of use at all. The cookie is marked as a 'session' type of cookie, which means it will expire (be deleted automatically) when the browser is closed or cleaned by the browser after a set period of non-use. No personal information is collected, stored or sold to third parties.